Sour is a word to describe a lot of Polish food – it is a taste well-loved by Poles! Often this sour comes from lactic acid which is made during fermentation by Lactobacillus bacteria to produce such foods as: gherkins, sauerkraut, sourdough, soured cream, soured milk and yoghurt. Żurek is a soup made with sour rye (zakwas) as a base. Water is added to rye flour or rye bread and it is allowed to ferment for a few day. In olden times this soup was often made on the same day as rye bread was being made. Nowadays you can buy żurek starter or zakwas in the Polish supermarkets and this is what I use, (one day I will make my own) and it tastes very good. My mother never made this soup and in fact I had not heard of it until my Polish cousin’s daughters worked in a Polish restaurant in London in the 1990s and I had some there. It is often cooked with smoked bacon and Polish sausage – kiełbasa – and then served with quartered or chopped hard boiled eggs. Some people serve this at the Easter breakfast using the sausage and hard-boiled eggs which have been blessed on Easter Saturday. Season as necessary but the bacon and sausage usually provide enough salt. Peel the carrots and parboil them whole. Once cooled, chop the carrots and potatoes. Chop the bacon into little squares. Chop the sausage into small pieces. Add water to cover the vegetables & half to three quarters fill the pan. Bring to the boil, then cover the pan and simmer for a couple of hours. Chop the hard boiled eggs into long quarters or roughly chop them. Pour the soup into dishes and place the quarters on top or scatter the chopped egg on top. In olden times when fasting & abstinence in Lent was much more strict, many people did not eat meat or eggs in Lent. Many lived on a very meagre diet of meatless żurek with hardy any vegetables and there was often a ceremony of burying the żurek at the end of Lent. This recipe is not as meagre as that, it is made with lots of vegetables and served with hard-boiled eggs or rye bread croutons. *Depends on what is available – try and have at least 2 of these root vegetables & adjust the amounts to suit what you can get. I think the sweetness in the root vegetables counteracts some of the sourness of the sour rye, so I add lots of soured cream & sometimes some lemon juice. Hard boiled eggs to serve – at least one per person or rye bread croutons. For all the root vegetables, peel as necessary – you can parboil or steam them if that makes them easier to prepare. Chop the root vegetables into rough cubes. Add all the vegetables & onion to a large pan or stockpot of water. Add the bay leaf, allspice and peppercorns. Bring to the boil and then simmer for around two hours until the vegetables are soft or place in a low oven for several hours. Gently stir in the soured cream – whisk a little if it starts to go into lumps. Add some lemon juice to the required sourness! Sprinkle in the rest of the parsley. 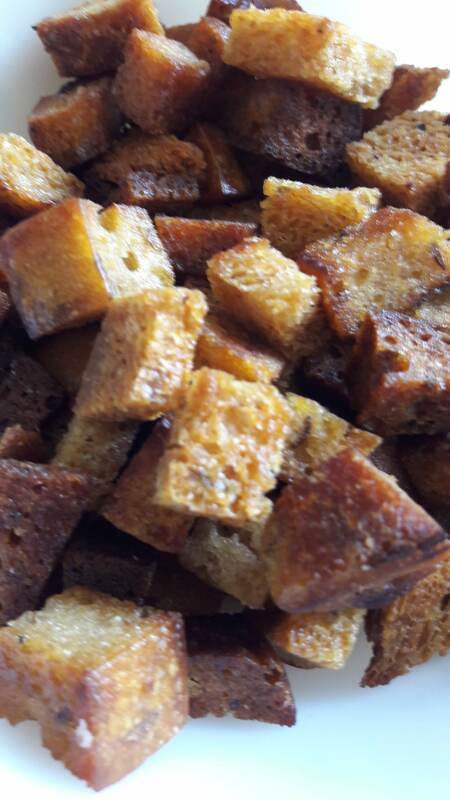 To serve – add the quartered or chopped hard-boiled eggs on top, or the rye bread croutons. Served in soup plates – Glenwood by Crown Devon Fielding, Made in England. These are the only 3 left from my Mama. I think she must have had 8 or even 12, they are there in memories of my childhood with lots of people sitting around the table. I have read that they were produced from 1939 -how my Mama aquired these I do not know!